Cinemablographer: More Award Wins for the NFB! Two National Film Board of Canada (NFB) interactive productions were honoured at the 2012 Digi Awards ceremony in Toronto on December 4, with Bear 71 named Best Web Series: Non-fiction and Burquette winning the Best in Canadian Culture award. 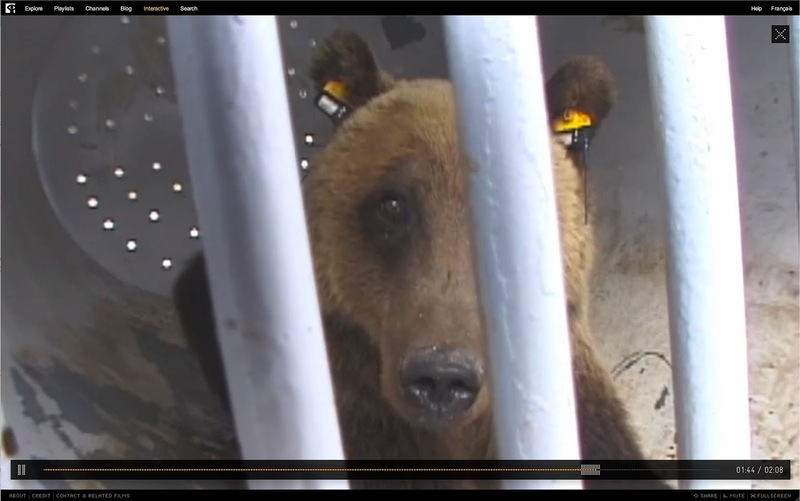 Bear 71 is an interactive multi-user experience told from the point of view of an omniscient female grizzly bear, dubbed “Bear 71” by the Banff National Park rangers who radio collar and track her. It was created by Jeremy Mendes, Leanne Allison and the NFB’s Loc Dao, executive producer and chief technologist for the NFB’s English-language Digital Studio, based in Vancouver. Bear 71 was produced by Dao, Edmonton-based NFB producer Bonnie Thompson, Dana Dansereau and Rob McLaughlin. Burquette began as a comic book drawn by Francis Desharnais and published by Éditions Les 400 coups. Now an interactive website, it features a series of animated clips, with additional drawings—inspired by themes submitted by Web users—published online. The Burquette web comic was produced by Julie Roy (NFB) and Josée Vallée (Cirrus Communications), with René Chénier as NFB executive producer. The website is a Cirrus Communications and NFB co-production, with the participation of Turbulent Média (Christiane Asselin, producer). The NFB and its creative team have now won seven Digi Awards, which recognize Canadian companies that have demonstrated constant dedication and success in enhancing and enriching the field of digital media in Canada and abroad.